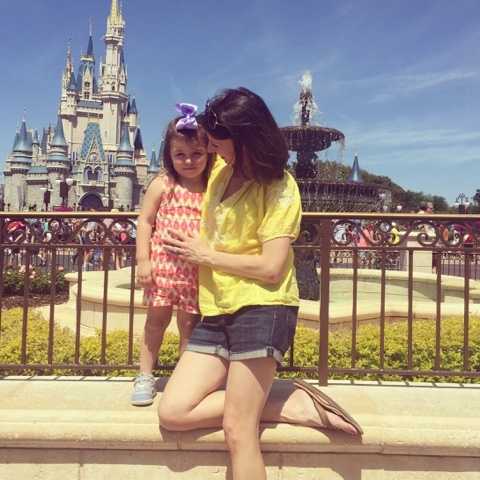 I'm going to save you the bajillion photos on my camera and iPhone of Camille at Disneyworld, because as adorable as she is, that is the type of thing only a parent really appreciates. 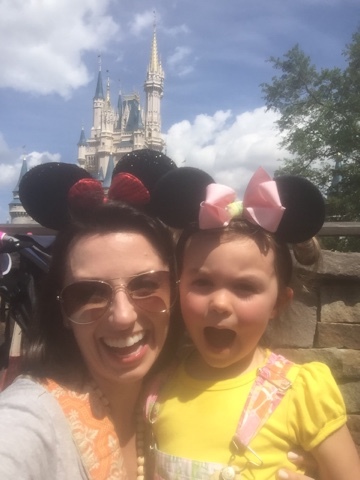 But what I am going to do is share some of the things I learned from our trip with a (nearly) three year old to Magic Kingdom! First things first ... why did we take Camille at such a young age? And what about Baby Charlotte? This trip was definitely not something we planned, but my husband had an opportunity to go to Orlando for a work conference. It didn't hurt that his conference was at the Ritz (sign me up, immediately?!). 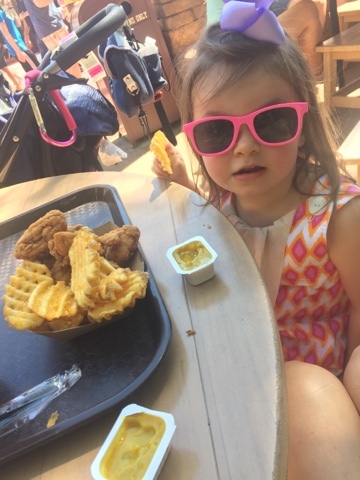 Camille being six weeks shy of turning three meant that she did not require a ticket to the parks, which was a big cost savings. So, while I would never say that us deciding to go was "cheap" (because it was not), it was definitely less expensive than it will be when she and Charlotte are older. We bought three flights to/from Florida, our room cost was covered for two out of the three nights, and I was the only one who needed a theme park ticket. It was $199 for the two days to Magic Kingdom. We did decide to leave Charlotte at home with my mother-in-law. I missed her TERRIBLY. And I'm still nursing her, so that meant extra work for me the last several weeks to pump an extra bottle most days to build up a freezer stash. But it would have been overwhelming for me to have both girls there by myself, and frankly, the solo time with Camille was just what the doctor ordered. I think it was really special for her to have our undivided attention. Why Magic Kingdom for both days? There is so much to do at MK, and I knew we wouldn't be spending hours upon hours there each day. When the girls are older, we will do longer days and will NOT miss the nighttime fireworks. But for this trip, Camille and I got to the park each day around 9:30 and stayed until we were tired ... around 6:00 the first day and 3:00 the second day. Camille blew through her normal 2pm nap both days but slept as we were leaving the park in the stroller (we brought our BOB stroller). Magic Kingdom has more "princessey" stuff as opposed to the other parks which is right up her alley. And you just can't beat that classic castle photo! What did I bring in my bag? Having the BOB was really nice because of all of the space and storage it has. It wasn't the easiest to get in/out of cabs and Ubers, but I let the drivers help with that. I didn't want to be the one to ding up their cars. :) It was also big enough of a stroller that I think it helped us have a little more of a buffer around us in crowds -- it bought us a little more personal space, if that makes sense. I packed a small crossbody purse that I kept essentials in ... credit card, license, cash, phone, chapstick with SPF, and the Fast Pass card they gave me (we had this instead of the armbands you've probably seen in photos). Then, in a tote bag under the BOB I kept some other items: lots of snacks, water bottles, a spray mister and fan (SO IMPORTANT ... we have this one and highly recommend it), two ponchos, baby wipes. 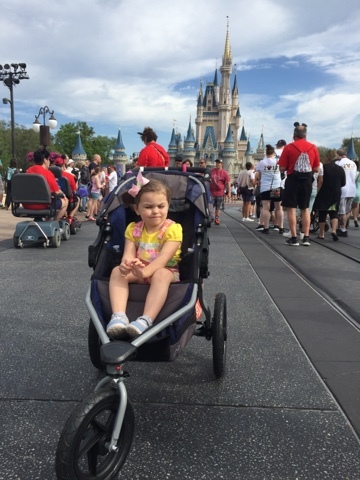 Stroller parking at Disney is SO easy and I quickly got over my fear that someone was going to steal the stroller. What did I bring on day 2 that I forgot on day 1? Sunglasses for Camille (get a few pair from the dollar store -- leave the nicer ones at home!). A brush for her hair. If you're doing something for a photo opp, like meeting a princess, schedule it for early in the morning when your child looks fresh, or bring a comb to straighten up their hair! What did I wish I had packed? A cell phone charger, the portable kind... like this. Our Disney planner (more on this tomorrow!) advised me to bring one and I forgot. I brought a charging cord and didn't see a single spot to charge my phone. As I left the park at 6pm on day 1, my phone had 4% charge. For day 2, I immediately turned my phone on the battery saver option in the morning and it was around 40% when we left at 3. Not too bad. I didn't use my phone a ton for social media, just the occasional Snapchat photo or video, but I did use it for taking lots of photos and logging in to my Disney app to book Fast Passes. What were our favorite rides? Aladdin's Magic Carpet, Peter Pan, Dumbo, Pirates of the Caribbean, the teacups, Ariel's ride, the carousel. 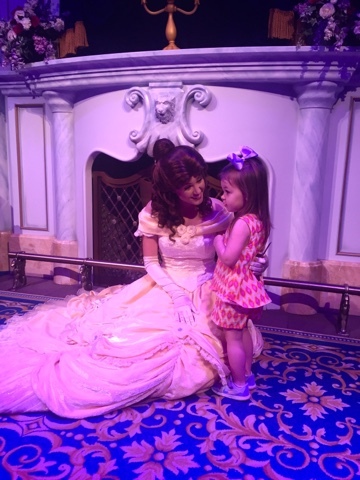 We met lots of princesses which was the TRUE highlight -- we did Enchanted Tales with Belle, a meet & greet with Cinderella and Elena, we met Ariel in her Grotto, we met Merida, and we met the man himself, Mickey. Camille also LOVED the parades ... we caught the Festival of Fantasy parade Friday at 3 (Elsa and Anna are in this one) and the Move It! Shake It! Dance & Play It! street party on Saturday at 12:30. Lastly, there was a really cute stage show at the castle that plays several times a day (this one) and it has several characters in it including Elsa and Anna. Since you can only meet them at Epcot, it was nice to see them in the parade and show. The Fast Pass is my favorite thing ever. Especially with a potty-training toddler. It was more important to me for us to just ride rides that had little to no wait. I didn't really care what we were on as long as we were on a ride. You can book three FPs, and my planner helped me book our three in the mornings which is HUGE. They have a one-hour window and you can't make them overlap. But once you scan your 3rd FP for the day, you can book another one. I loved having FPs for 9am, 10am, 11am, and then as soon as we rode that last ride, we could book another one. But, had they been spread apart, like at 9, 12, and 3:30, then that would mean that we couldn't book another one until that 3:30 ride was over. We didn't spend a ton at the park either day. We didn't buy any souvenirs or toys, just a few meals. We shared a croque monsieur at Be Our Guest, later I bought Camille a chocolate-dipped rice krispie treat in the shape of Mickey's head. On day 2 we shared a $5 frozen lemonade, then shared a $9 chicken nuggets and fries platter, and later we enjoyed that delicious Dole Whip float that everyone raves about. So, we just drank our own water, ate our own snacks, and saved our money where we could! I felt like everyone and their mother had on matching custom Disney shirts. We didn't go that route and ... WE SURVIVED. ;-) You don't have to drop a boatload on special clothing, stroller signs, et cetera. I did dress her in bright clothing that would make her easy to spot in a crowd. On day one, we matched which was a lot of fun! Shorts are great, and Camille wore tennis shoes each day. I wore tennis shoes on day 1 and my trusty ol' Rainbows on day 2 since I knew we would be doing less walking. After being there two days, I sure learned a lot! I'm no pro but I will be happy to answer any questions you have about our experience. 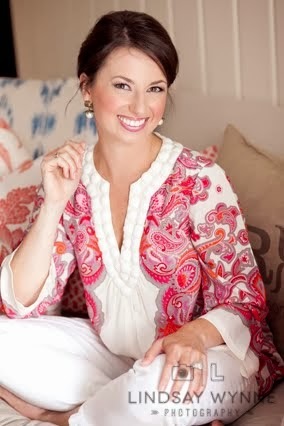 Speaking of pros, check back tomorrow to read some pointers from our Disney planner extraordinaire, Jenny! I had no idea you could return them for a refund! That's crazy smart! These are great tips! I love how you went about it, and I think it is so special that you had the time with just Camille! The Fastpass was seriously genius. It saved so much time. That's a great tip to get them all scheduled early in the day. I can't wait to hear from your Disney planner too! How fun! And how AWESOME to spend that special time with just Camille! 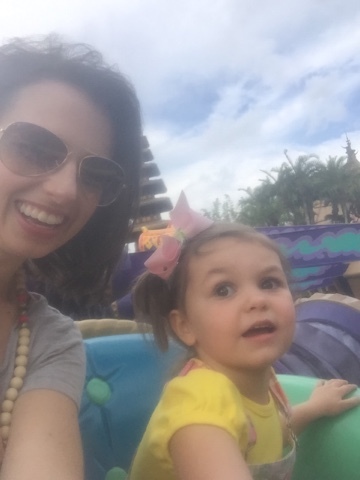 I know she loved every minute of Disney magic with her mama!